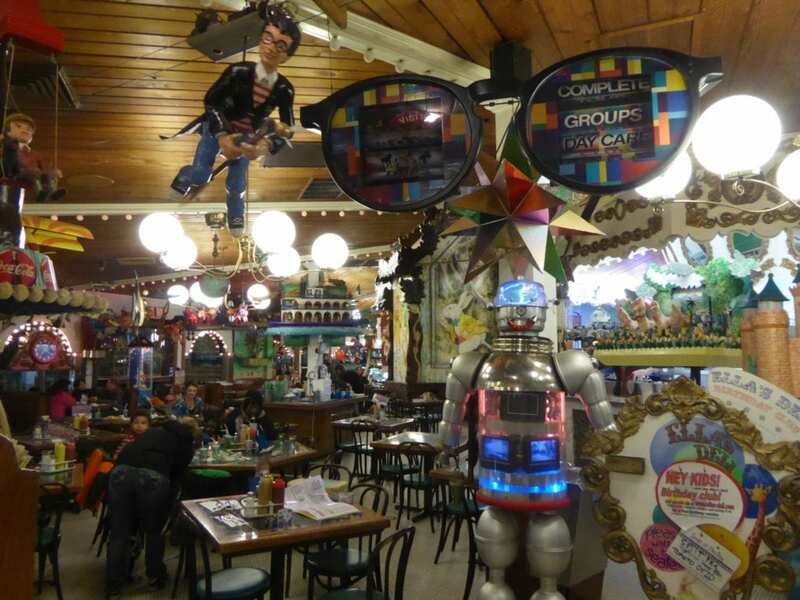 Photo by Jamie Bartosch/Suburban TravelingMom Ella's Deli in Madison, Wisconsin is a fun restaurant for kids. Rainforest Café is a fun restaurant for kids, with its dinosaur-shaped chicken nuggets and jungle-like special effects. But, like every chain restaurant, you can find them all over and the experience is all the same. Why not go for kid friendly restaurants that make great family memories while serving unique and yummy food? Here are 10 places that ooze with personality. There’s a lot to look at in Ella’s Deli in Madison, Wisconsin. 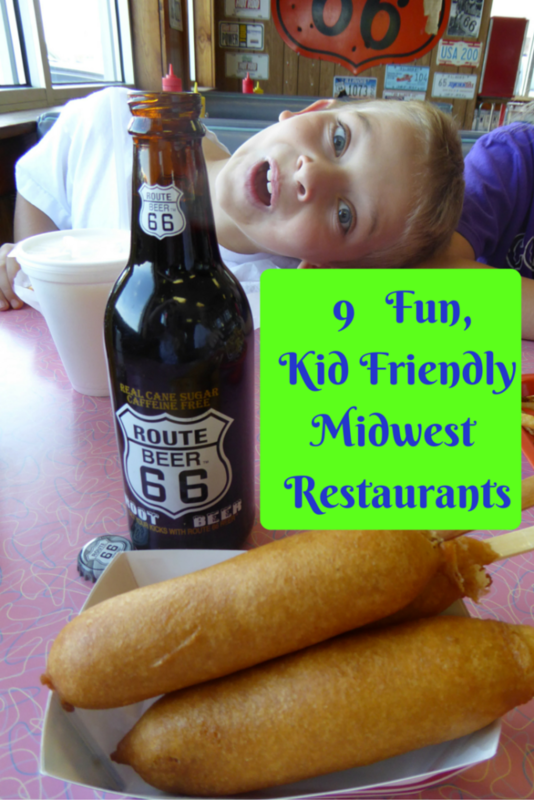 My kids and I like searching out local eats when we travel and we’ve found some amazing places over the years, including these 10 in the Midwest. There are places older kids will like (Safe House in Milwaukee, Wisconsin). And places aimed at young kids (The Choo-Choo Restaurant in Des Plaines, Illinois). All of them are worth the trip. A lot of them are retro and kooky, but they’re all budget-friendly and delicious. 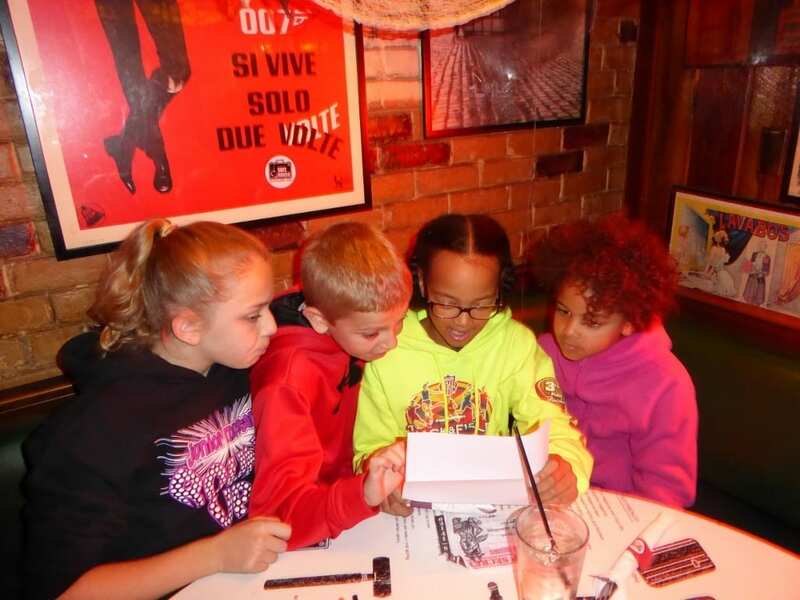 Kids review their mission while dining at Safe House, a spy-themed restaurant and museum in downtown Milwaukee. Kids love the puzzle-solving that’s part of the dining experience at this combination restaurant/spy museum. Just getting in and out of the restaurant is a trip. So is walking around to see all of the spy exhibits in the different rooms. My review of the restaurant is here. Hiya! That’s the greeting on the box you’ll get, with your Superdawg (hot dog), fries and pickle all smashed in. I think it’s one of the best hot dogs in Chicago. You’ll easily spot this retro drive-in restaurant, because it has two huge hot dog statues on the roof. 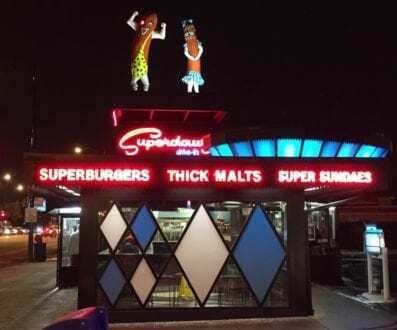 Superdawg is one of the best hot dog spots in Chicago, and kids love the iconic hot dog figures on the roof. Tip: when you’re ordering, they’re not hot dogs. They’re Superdawgs. And remember, real Chicagoans don’t put ketchup on their hot dogs. If your daughter is an American Girl Doll fan, then meals with their dolls at these cafes will be everything. Doll chairs and doll “meals” are part of the experience. 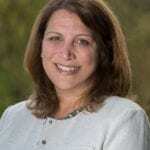 Similar experiences are at the American Girl Bistros in Minneapolis, Minnesota, Columbus, Ohio, or St. Louis, Missouri. 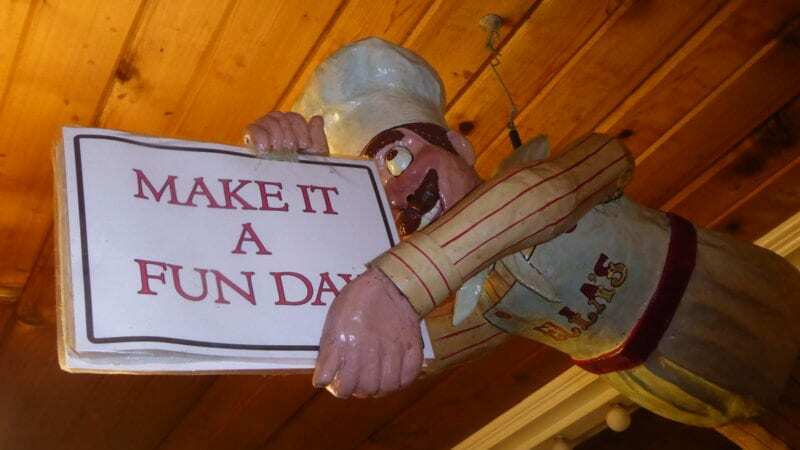 Described as “a country club on crack,” this kooky, retro restaurant has a mini golf course and a ferris wheel with skyline views. You can go once around the ferris wheel (which they call a “vertically revolving patio”) with a drink, or go around five times while having your meal in a private car. Just remember – this is Minnesota. It can be kinda chilly up there. 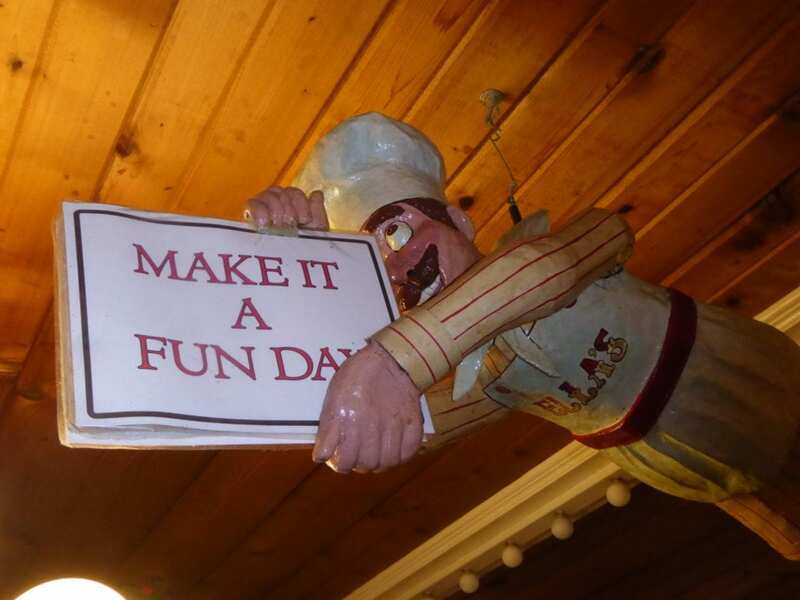 Ella’s Deli in Madison, Wisconsin is a fun restaurant for kids. It’s difficult to describe this place. It’s filled with colorful, moving paper mache characters, including its landmark carousel. While we ate dinner there in January, Batman slowly flew overhead, puppets manically swung on a nearby pole, and a solar system moved beneath the glass on our table. The Jewish deli food includes an 11-page dessert menu. A more detailed review is within this post of mine about fun things to do in Madison. Plate-sized pancakes are fun kids meals at Charlie Parker’s in Springfield, Illinois. 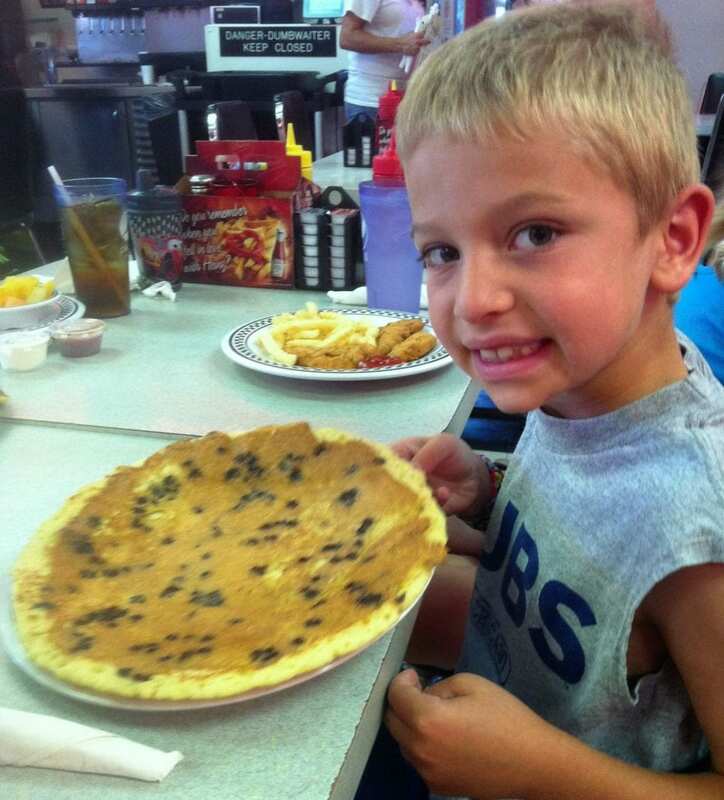 The pancakes here are bigger than the plate they’re served on, which makes kids’ faces light up. Featured on Food Network’s “Diners, Drive-Ins and Dives,” this restaurant is housed inside a World War II Quonset hut. The interior is a 50s styled diner. If your arteries can take it, try a Springfield specialty known as “horseshoes.” Charlie Parker’s Breakfast Shoe, for example, has eggs, hash browns and your choice of meat smothered in cheese sauce AND gravy. It’s so wrong, it’s right. Warning: it’s only open for breakfast and lunch. They usually close at 2 p.m.
Freshly dipped corn dogs and Route 66 root beer are the specialties at this throwback, memorabilia-covered spot right off I-55 (also the legendary Route 66), between Chicago and St. Louis. The place is filled with Route 66 memorabilia. This popular burgers-and-shakes joint is currently closed, because it’s relocating to a new downtown location, but should reopen in the summer of 2016. Tweens and teens love to tussle with the restaurant’s famous sassy-mouthed and dancing servers. Where have you have the best local food experience? Share with us in the comment section below.